In response to the desperate pleas of an affected family, the seeds of AAF were sown innocuously in 1998. Dr. Shabina Ahmed, MBBS, MD, our managing Trustee, a Consultant Developmental Pediatrician, started devoting about 10 hours weekly of her clinical practice on a behavioral modification program for one of her patients with autism. This service gradually grew with more children attending, who came on hearing of it or through referrals by colleagues; soon, a SPECIAL NEEDS section was started in a single room at Bhangagarh, Guwahati, in 1999. Seeing the poor community awareness on the subject, Dr. Ahmed started her sensitization programmes that took her around the country. She is currently involved with workshops on autism and is a resource person for RCI (Rehabilitation Council of India) sponsored training programmes. Sensing the need to sustain this effort, a group of like-minded persons decided to form the Assam Autism Foundation in 2003 as an organisation for the benefit of these differently abled children. It is a public charitable trust reg. under the Indian Trust Act 1882. Reg.No. 1414/04, National Trust Regd. No. 0319, Assam State Reg. No. 83, with the objective of working for children with developmental disabilities with special focus on AUTISM which is a Speech and Communication disorder, which has remained unaddressed so far in this part of the country. The board of Trustees in the organization strongly felt that this is the need of the hour as we are loosing out on a large group of Human resource of the country and that adequate parental support is required to keep up with the difficulties of these children. 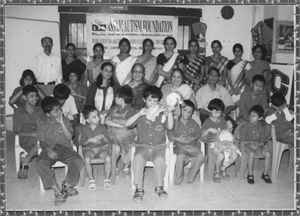 This step led to the establishment of the first pillar of help to the children of AUTISM in Northeast India. Our Philosophy : "LET NO CHILD BEHIND AND SOCIAL INCLUSION IS NECESSARY FOR TOTAL REHABILITATION"
Our Vision : To develop state-of-art rehabilitation centre with special focus on speech and communication along with facilities for respite home and develop vocational units for self employment and independent living.